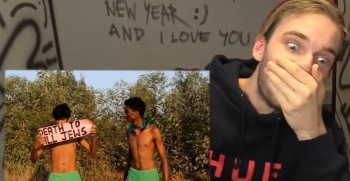 Disney has reportedly cancelled the second season of PewDiePie's YouTube reality show: Scare PewDiePie, over some anti-Semitic posts. Popular YouTube personality Felix "Pewdiepie" Kjellberg has just had the rug pulled from under him regarding his YouTube realtiy show: Scare PewDiePie. Both Disney and Google have announced that they are severing ties with the star, and although an official reason has not been given, the timing suggests it was due to some anti-semitic stunts that Kjellberg has been pulling. "We've decided to cancel the release of Scare PewDiePie Season 2 and we're removing the PewDiePie channel from Google Preferred," a YouTube spokesperson said. Nine of PewDiePie's videos are alleged to contain anti-Semitic imagery, including one recent video that featured the YouTube star commissioning two comedians to make a "Death to all Jews" banner, which you can see in the image above. Scare PewDiePie was a collaboration between Disney's Maker Studios and The Walking Dead parent company Skybound Entertainment. As the title may suggest, Kjellberg was exposed to a number of frightening, video game-inspired scenarios intended to scare him.